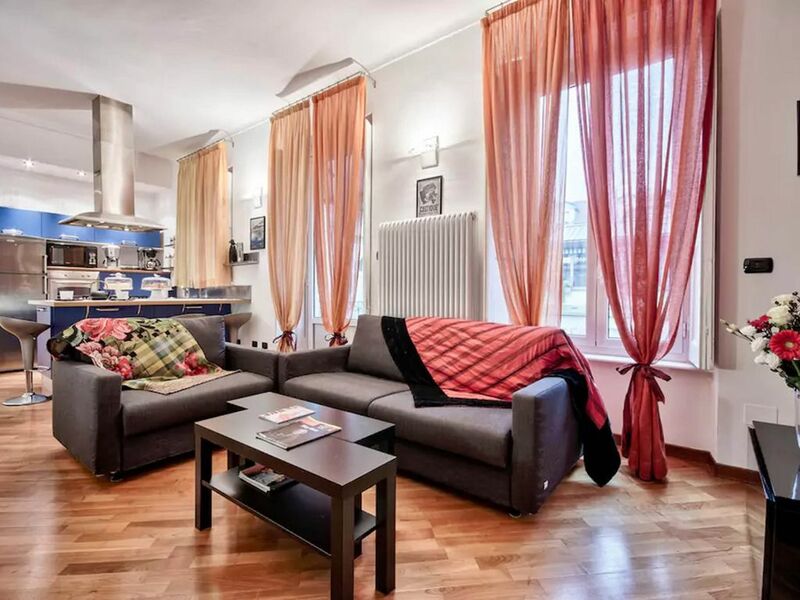 Exclusive luxury comfortable quiet apartment located in the heart of Turin's center. It features Air Conditioning, Fully Equipped Kitchen, Hydromassage Shower, Turkish Bath, TV Home Theatre DolbySurrond, Fast WiFi, Gym and reception at the ground floor. All included: linens, towels, hair dryer, electricity, gas, water, tax, etc ..
Extras on request (by payment): parking, baby crib, maid service During staying. This apartment is located in 'Palazzo Lagrange' the famous historic building were Louis Lagrange was born. This building gives the name to the most famous street of Turin. Is situated in the most trendiest pedestrian block of Turin, I know every major brand store and restaurant imaginable is almost literally at your front door. Minutes away from the most important historic buildings and best attractions of town. Piazza San Carlo, Piazza Castello, the Royal Palace, Museum of Cinema Mole Antonelliana are all Within walking distance and the famous Egyptian Museum is just steps away. Also this building is just 2 blocks from the Porta Nuova train station and subway trains, Allowing easy access to the Lingotto and to the rest of town. If you prefer taxis you will find cubs just in front of the entrance of the building. If you walk 2 blocks blackberries you will arrive to San Salvario (where you can find a plethora of dance clubs, live music, and pubs) or to the Valentino Park (where you can walk along the Po river, ride a bike or rent a rickshaw). This building is really quiet and safe. At the ground floor there is the reception and a Gym where you can go with a small entrance fee. Your privacy will be granted During the whole length of your stay. Whether you're visiting the city for the first time or are a regular business traveler to the area, you'll Find That the loft amenities Provide everything you'll need for a comfortable stay in Turin. The apartment is very comfortable and really quiet Because It's not street side. Everything you'll need to recharge, relax and rest. It's a modern apartment completely renovated with high class furniture and decorations situated on the second floor. You will have full use of the entire guesthouse. There are no other guests scheduled in the period When you plan to visit and we will not be present in the apartment During The length of your stay. Double room with high open view on the rest of apartment features a full-size premium double futon bed for maximum comfort original lying on the mat and dressed with linens, his and her bathrobes and a down comforter perfect for couples. Fully equipped kitchen comes with a counter height seating for 4, fridge, oven, microwave, dish washer, coffee maker and teakettle. Includes kitchen utensils, glassware, pots, pans and everything else you would need to comfortably cook gourmet meals Throughout your stay. Living room area comes with two very comfortable sofa bed (double and single bed) with exra thick memory foam mattress That can be dressed with linens for three extra guests. Enjoy complimentary high-speed wireless Internet, Basic Cable TV on a Home Cinema Theatre Dolby Surround System. A professional poker table is available if you like. Select your shower pleasure with the Raindance, take care of your body with aromatic Turkish Bath or Hydromassage, complete with full-length mirror, hairdryer and bath towels. The office area has a big desk for laptop or different works. If you need you will find in the laundry corner the washing machine and the clotheshorse. Also available is an air conditioner During hot summer days and central heating During cold winter nights. Fully Equipped Kitchen, Hydromassage, Turkish Bath, Home Theatre Cinema Dolby Surround, Fast and free WiFi, Gym and reception at the ground floor of the building. A group of 5 would mean two guests in the bedroom, two guests on the double sofa bed and 1 guest on the single sofa bed of the living room. Right at the heart of everything yet private! Matteo is very accommodating and helpful! There are stairs so be aware. Torino is as they say, a little Paris and Matteo's place is the perfect spot to explore from.